Kevin Weil member of Twitter Analytics team posted the number of daily tweets throughout the twitter. According to him Twitter users are sending a whopping 50 Million tweets daily that means 600 tweets per second (That’s a lot). These numbers do not include tweets from accounts, which are marked as spam. In January 2010, twitter received 1.2 billion tweets that are thirty nine (39) million tweets per day though the twitter network. These stats are not from Twitter. 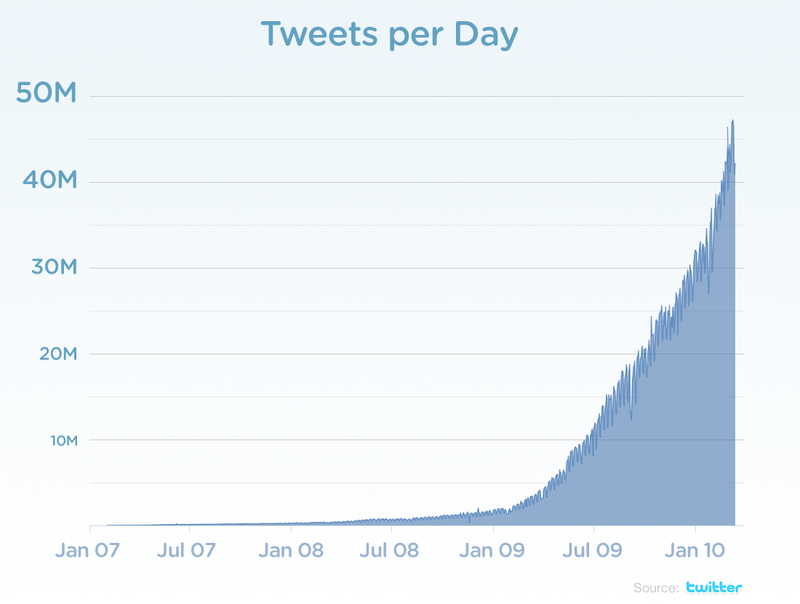 In 2007, 5000 tweets were sent daily which increased to 300,000 tweets in 2008. 2.5 million daily tweets were sent in earlier 2009, which grew up to 35 million tweets by the end of the year. Twitter users sent 50 million tweets yesterday. These stats however, are enough to keep anyone silent who thinks twitter is not growing. According to Kevin Weil, tweets are just one way to determine network’s growth and they will come up with detailed information later. 2 Responses to "Twitter Reaches 50 Million Tweets Daily"
That’s a lot of tweets per day.